I rarely buy meat from the supermarket, preferring instead to support a network of local suppliers. But I’m also not immune to a bargain, so when I saw a ten-pound pork shoulder at the Stop & Shop for only ten bucks, I snatched it up. 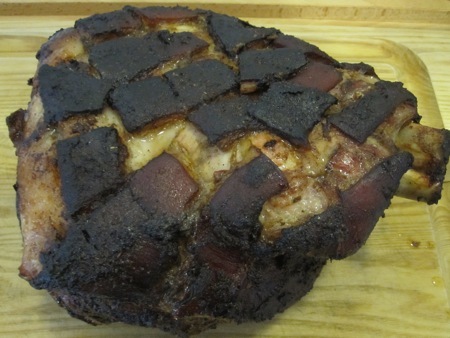 I knew that factory pork would require a substantial flavor boost, which is when I remembered Mark Bittman’s recipe for pernil, Puerto Rican roast pork shoulder. It wouldn’t approach the gold standard of another Puerto Rican meal, the Best Pig Ever, but I figured I could treat the huge slab of meat properly. 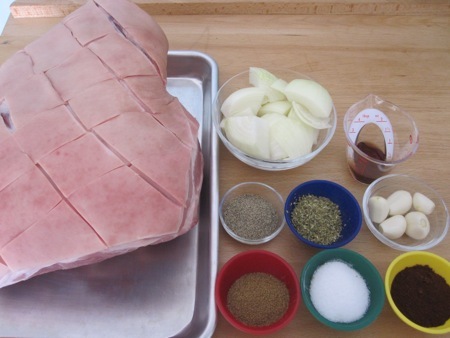 I started with the shoulder (skin scored in a crosshatch pattern); a large onion cut into chunks; four peeled garlic cloves; a tablespoon each of ground cumin, dried oregano, salt, and red wine vinegar; a teaspoon of chile powder; and two teaspoons of ground black pepper. 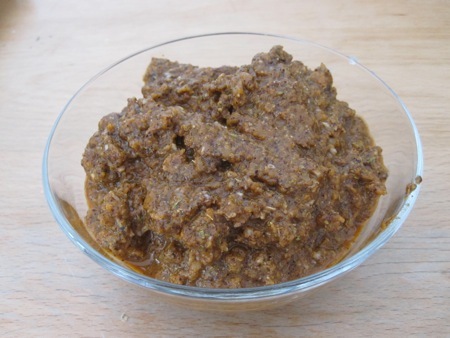 I pulsed all of the non-pork ingredients together in the food processor, adding just enough olive oil to make a thick paste. I rubbed the paste into the pork, working it into the cuts and crevices. I placed the shoulder in a roasting pan and filmed the bottom with about a cup of water. I put the pan into a 300°F oven to roast. I turned the pork over every hour, adding more water as necessary and occasionally scooping up the paste from the bottom of the pan and re-spreading it over the meat. 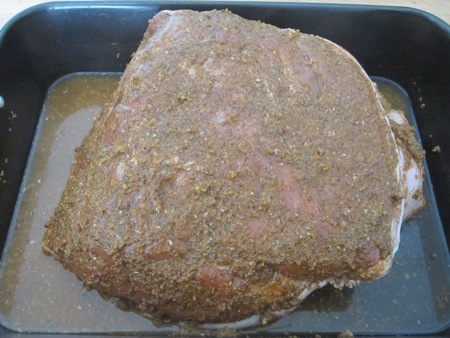 After about six hours, the skin had crisped up and the meat was pulling away from the bone. 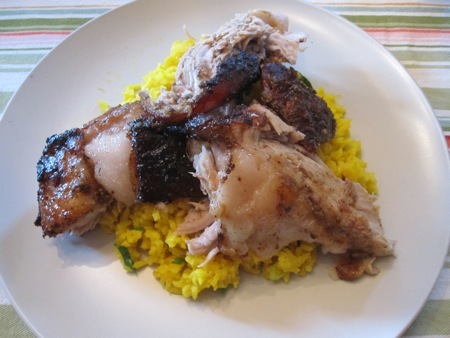 After a short rest, I pulled chunks of pork off the bone and served them over yellow rice with line wedges on the side. The pork had a nice balance of fat and lean, although He Who Will Not Be Ignored preferred the fattier bits. A bit of heat, a hint of smoke from the chile, and some acidity from the lime juice all combined to remind me of a similar meal at a roadside lechonera. I also have a whole lot of leftover roast pork, which will become tacos, tostadas, and whatever else I can think to make before it gets snacked out of existence.